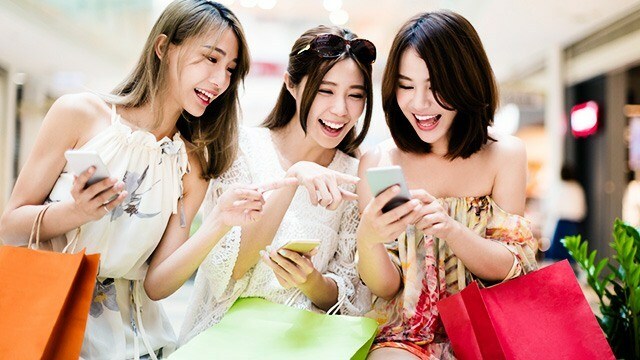 The usual Filipino consumer makes an average of six to seven searches online while considering two to three brands before making a purchase, according to the Path to Purchase report by Google and Kantar TNS. The study looked into the online behavior of Filipino shoppers who search for finance products like credit cards or loans, as well as groceries and baby care products. Overall, the study stated that about 49 percent of the pre-purchase searches for baby care products are about prices while 48 percent are for finding user reviews. Among grocery shoppers, 46 percent seek user reviews while 45 percent compare prices. Consumers applying for credit cards or loans do seven searches on average. Based on the findings, 49 percent are looking for the provider’s website, 48 percent are searching for promotions and rewards and 48 percent of the search topics are about the card’s availability and features. 1. These days, you can’t spell “research” without “search.” Thirty-six percent of baby care, 23 percent of grocery and 37 percent of finance consumers used a search engine at some point during their path to purchase. 2. Search also unlocks brand discovery. 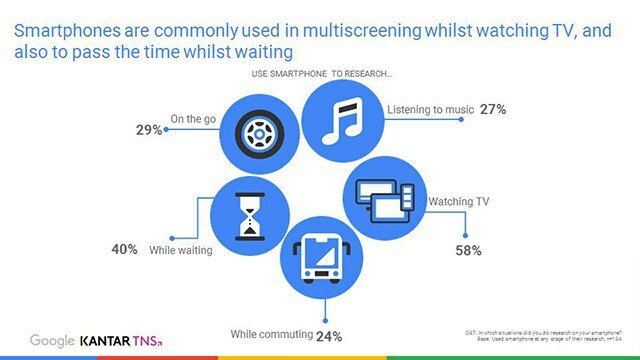 The study stated that consumers keep searching until they’re comfortable with their decision. Across categories, consumers conducted six to seven searches before buying. 3. Search queries reflect consumer intent. 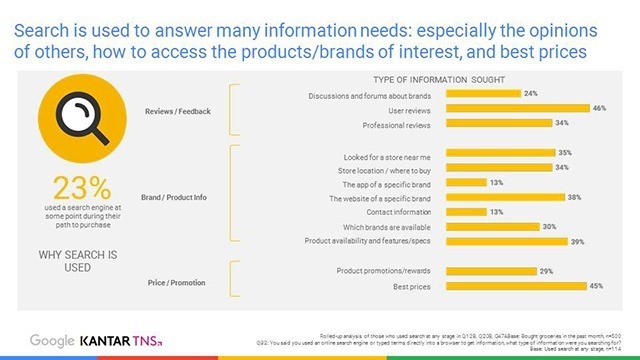 Consumers want information not just on specific products or brands, but everything to do with the topic. The most popular searches are about offerings, prices and reviews. 4. Search connects intent and action. After initial research, consumers who needed further research for convincing are those looking for financial products at 46 percent and baby care products at 43 percent. The percentage of consumers who needed additional research for grocery is just 25 percent. After seeing the brand or product online, 24 percent of those who searched for grocery items go to the actual store, and the same is true for 23 percent of baby care and 20 percent of those searching for financial products. Only 13 percent of those who looked for baby care, 11 percent of grocery and 18 percent of financial products purchased online after searching. 5. Search supports brand building. People discover brands when using search engines. For those looking for baby care products, their top five online sources of brand awareness are search engines, social media, brand’s site, online video and retailer website. For those looking to fill their grocery carts, the top source of information is also search engines, followed by online video, social, media, retailer or supermarket website and other websites. For those looking for financial products, their top resource is the provider or bank’s website, followed by search engines. 6. Search plays an important role all along the path to purchase. For all those who searched online for baby care, 35 percent of them actually looked for the brand they searched for in the stores, while 34 percent of those who looked for grocery items did the same as well as the 23 percent of those who were searching for financial products. Brands and businesses have to acknowledge that consumers are now actively looking for information online. For baby care, 77 percent conduct research prior to purchase, 52 percent for grocery and 75 percent for financial decisions. The consumer’s mind is a highly competitive space. Buyers consider two to three brands before purchasing, although a significant number (92 percent for baby care, 79 percent for grocery and 85 percent for financial products) are more likely to purchase their preferred brand. 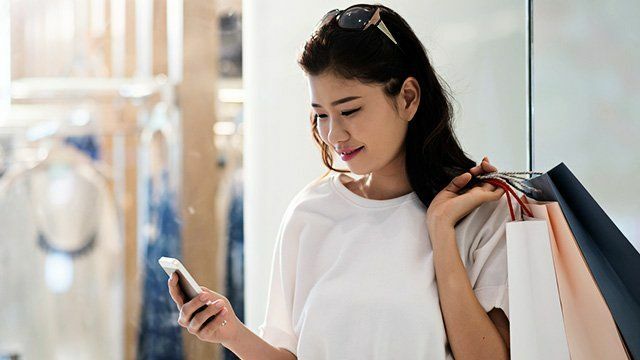 Despite this loyalty, these consumers still discover new brands through search—as much as 59 percent for those searching for baby care, 50 percent for financial products and 48 percent for grocery. In terms of content format, video plays a crucial role in purchase decisions and brand perception. Eighty-one percent of Filipinos in the study say that online videos convinced them to think more positively about a brand. They also went in-store to look up the brand after watching their videos. Among the different sources of online video, YouTube is the most widely used. These consumers also watch videos posted on social media. After watching the video, these consumers are encouraged to look up the product or service to learn more about it. Desktop computers (47 percent for baby care, 34 percent for grocery and 53 percent for finance) are still prevalently used for research but smartphones are used for convenience to enable buyers to research wherever, whenever. In fact, more than 50 percent of grocery shoppers and baby care product buyers did smartphone searches while watching television. Sixty-one percent of consumers applying for credit cards or loans used smartphones also. 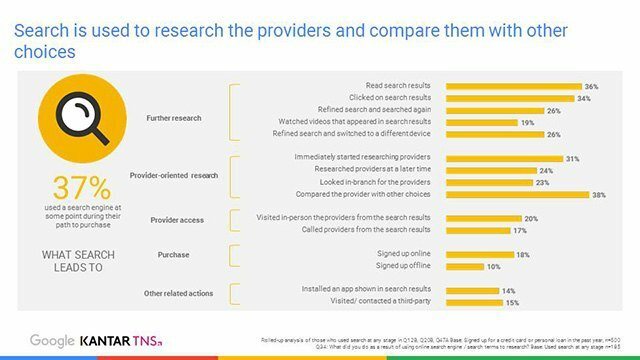 Google Philippines Marketing Head Gabby Roxas said this study proves that Filipinos are now more aware of the power of search as they actively look up resources online to help them make purchasing decisions. Did You Know Facebook Launched a YouTube Competitor?